As the title suggests, it’s about a pattern. Similar to Surgeon’s recent “As You Breathe Here Now” on Semantica, the new twelve is built on a simple but striking groove, which keeps repeating in the mind as if a chart buster heard on the radio. The original dirty bass techno from the man equals the definition of immersive and to-the-point beat science. After pleasing the floor, the B-side’s dub version appears with abstract notes of dark room electronics akin to British Murder Boys material, with drone layers and mutant unicorn whispers. While Surgeon is wisely keeping a relaxed release schedule, the Token single is another showdown in the dance department after the Anthony Child album on NNA and British Murder Boys EP for Downwards. 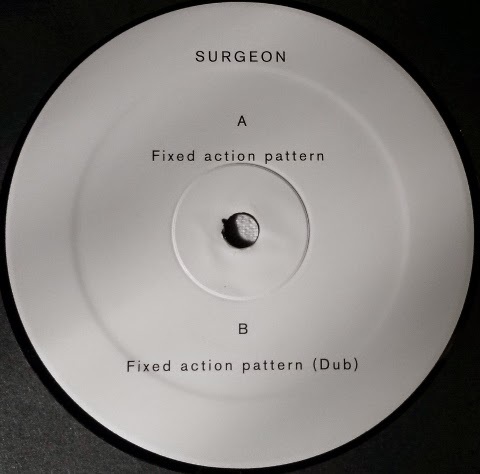 It also suggests that after having sailed the Seven Seas of techno, Surgeon is still capable to extract a catchy groove. “Fixed Action Pattern” is a prequel to “Aphelion”, Token’s forthcoming compilation of new and exclusive material.